← Quick Meta: Recommended BGMs, yay or nay? At first I had a bit of trouble blogging about this route. Maybe I just wasn’t absorbing as much as I could’ve been. I went back and skimmed through the route again, and I’ve come to feel I have a better understanding of the key messages Shizuru’s route has to offer. I think the biggest theme of this route is loss. This is probably the most ‘bad’ ending we’re gonna get, but I wouldn’t call it entirely bad. Lucia’s route had a lot of death, but not so much loss. Shizuru’s route brings together all the characters from other parts of the story together, and then taking them all away. It’s a ultimately a very sad route. There was a lot of info dropping in this one though. As a contrast to Chihaya’s route where the only option was to become stronger and fight, in this route Kotarou’s rewriting power only causes his harm, and he is told again and again that he shouldn’t fight. Sometimes choosing not to fight is the best option after all. This route had quite a lengthy common route branch, which focuses on the development of Shizuru’s relationship with Kotarou. In quite a rare occurrence for a Key game, Shizuru is actually the one who actively pursues Kotarou, instead of the other way around. Shizuru finds herself seeking out Kotarou more and more often, and the rest of the occult club comment on it and try to have Kotarou respond to it. In the beginning he didn’t really mind forming a relationship, but the biggest thing holding him back was his history with Kotori. Shizuru’s route is only unlocked after Kotori’s route has been played, so you could sorta call it a sequel to Kotori’s route. Reflecting back on Kotori’s route, we had the tension between the two resulting from Kotori refusing to let herself get too close to Kotarou, fearing that he was her familiar. She didn’t want to fall in love with her own desires. A part of her desperately wished that Kotarou could fall in love with someone else so that she would be relieved of the burden, and in this instance he has. Despite this, she displays quite a few mixed emotions over this turn of events. Clearly still experiencing feelings for Kotarou, maybe she felt a little jealous or sad to see Kotarou gradually disappear from her life, but when asked about it she did her best to convince Kotarou (and herself) that it was all right. Even after forming a romantic relationship with Shizuru, Kotarou still couldn’t keep Kotori out of his mind, but that’s to be expected since they had been childhood friends for so long. I’ll get back to that point later. After their feelings had begun to grow, Shizuru introduces Kotarou to her family, and reveals her past to him. Her memories of her father cooking her saury for dinner, the accident which awakened her latent superpowers, the trauma it caused her family, and how she unintentionally erased all of her parents’ memories of her. Kotarou of course felt powerless and unsure how to react to the knowledge, but Shizuru couldn’t help but feel a bit relieved that she had finally told someone about her past. As a result Kotarou’s feelings for her grew stronger, and a great desire to simply help her however he could took hold in his heart. 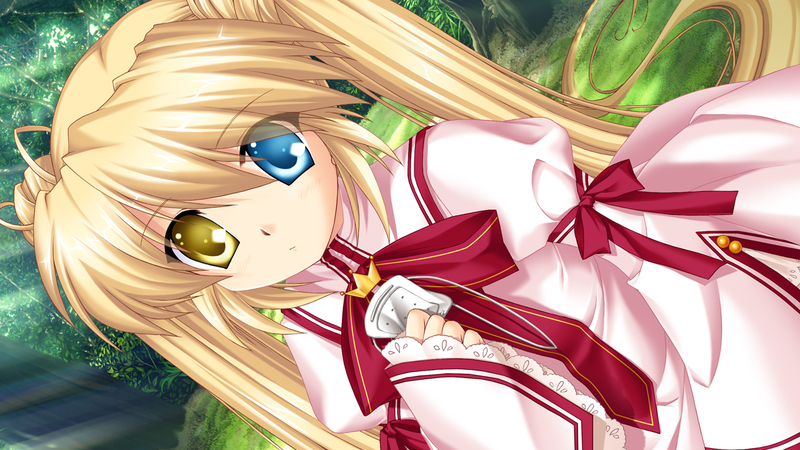 Not too soon after, the Leaf Dragon incident occurs again, and so begins Shizuru’s route. It actually starts out of chronological order in an interesting twist. We start the route one month after the incident, where Kotarou forces Gil and Pani to leave his home and he attends school to discover his absence. Trying to solve the mystery of where he’s been for the last month, he plays detective and follows a trail which eventually leads him to a comatose Shizuru who recently used her powers to erase his memories. At a complete loss of what to do, he spends all his time in her room exploring his thoughts and feelings to try and remember what exactly happened over the last month. The key to unlocking his memories lies in a feeling he remembers having, of wanting to make her happy. His last feelings before he died to the dinosaur familiar. The story flashes back to just after the leaf dragon incident, waking up in his bed much the same as he did at the start of the route, only with some slight differences. For example, he doesn’t kick Gil and Pani out of his room, and he doesn’t crush his phone. Later in the day he encounters Shizuru who informs him of the danger he’s in, and promises to act as his bodyguard for the time being. Kotarou is worried about what happened to all of the occult club members, Kotori especially. It appears Guardian don’t yet know anything about her whereabouts, but Shizuru insists that it’s too dangerous for Kotarou to go searching on his own. The following scenes are a bit of fluff about Kotarou and Shizuru’s domestic life, which gets progressively more lovey-dovey. But it serves it’s purpose. Midway through this, Kotarou disobeys Shizuru and heads out at night to look for Kotori. During his search he encounters familiars all over the city and is forced to fight some, running into a few guardian agents along the way. During the home scenes, Kotarou is reminded again of how Shizuru’s father used to cook Saury for her, and feels a little frustrated that he’ll never live up to that memory with his cooking. Soon after Kotarou is invited out to meet someone. They go out to to find Lucia at the ramen stand; her last meal in the town. After discovering that Lucia is leaving, Kotarou tries to hold their own little graduation ceremony with his cellphone. Imamiya comes to pick up Lucia, and warns Kotarou that he’s better off not becoming a warrior. This was the first of many farewells. Despite accepting Imamiya’s warning, he felt a slight desire to prove him wrong and be more useful, and so tried strengthening his left arm, which only resulted in permanent scabs forming on both of his arms. He is scolded by Nishikujou for attempting to rewrite himself without a good reason. Kotarou is torn between two ways of living – to live a peaceful life as someone protected, or to protect someone as a warrior. He wants to be of use to Shizuru, but isn’t sure how to do that. He eventually reaches the conclusion that he wants to lead a peaceful life together with Shizuru as a couple, and sets out to learn how to cook the best saury he can for her. With his mission complete, he is on his way home to surprise her with the saury, a simple pleasure that he can share with her. But on the way home he catches a glimpse of Kotori on a bus and abruptly abandons his plans, trying to find out where she was going. The trail leads into the forest, and against Shizuru’s warnings, he heads in to find her. As he continues deeper, he finds himself attacked by more and more familiars. He ends up getting completely lost in the forest and panics, running around frantically with no idea where to go. At the end he encounters the dinosaur familiar, and he realizes his death is imminent. All he can think about is Shizuru, his future he planned to make with her, and how the familiar was about to take everything he had away in an instant. In the end he couldn’t accept a peaceful life, and he couldn’t stop worrying about Kotori – and he regretted all of it. And so it happens; Kotarou is attacked, and Shizuru comes to save him just a moment too late. Shizuru is unable to heal him because he is a familiar, but she vows to keep him alive, and something happens which saves his life. Shizuru sacrifices herself to save Kotarou, and erases his memories so he can’t be hurt by her decision. 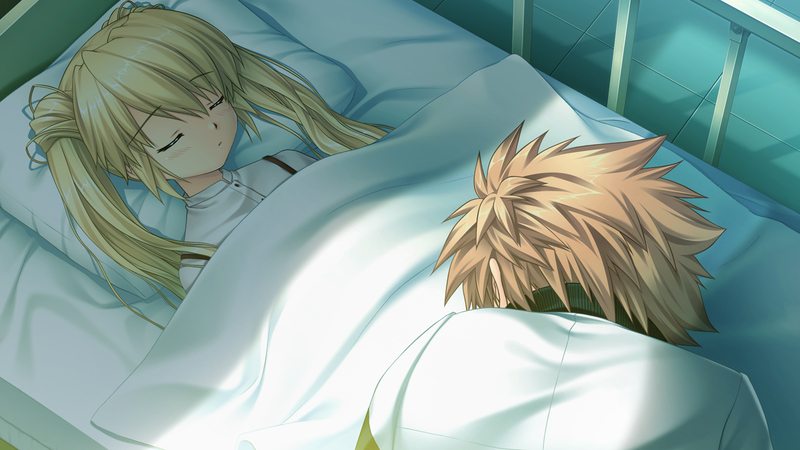 The story cuts back to Kotarou beside Shizuru’s bedside, having remembered everything. Cursing the situation, Kotarou suddenly feels a heat in his chest, and a voice speaks directly into his mind. The entity hears Kotarou’s pleas, and after saying goodbye, uses it’s power to revive Shizuru. Now this was very confusing at first, but I’m gonna take a crack at explaining it. The voice was definitely Kotori. As Kotarou’s ‘summoner’, she is able to speak directly into his mind and has some control over him. What Shizuru did to save Kotarou was form a contract with him as summoner and familiar, or perhaps it was all Kotori’s doing. By forming the contract, Kotarou drained all her life force away in order to survive, leaving Shizuru comatose. But then something happened, Kotori did something to save Shizuru. I can’t say for certain, but by the way she said goodbye, perhaps she sacrificed herself to save Shizuru. It’s pretty sad to think about, but I think that’s the most likely explanation. She used her remaining life force to revive Shizuru so the two could be together, accepting Shizuru as Kotarou’s future. Though it’s possible that she’s still alive, I can’t say for sure what happened. But either way, Kotori lost this time. It’s at this point where Kotarou has finally let go of Kotori as well, so it really does feel like a parting. From this point on Shizuru and Kotarou share a life. They can understand each other’s thoughts, and Shizuru can even feel Kotarou’s pain, possibly other senses too. Shizuru also loses her hearing and ability to speak even after being revived, so perhaps she hadn’t fully recovered from the ‘death’ they shared. Also, it seems after dying twice, Kotarou is even more of a familiar than he was before. Gradually becoming less human, he fears what he has become, and might yet still become. The next section of the story follows Kotarou getting to know the ins and outs of Guardian a bit better, with a little bit of fluff between him and Shizuru mixed in. Kotarou even ends up meeting Yoshino at the ramen stand, and says his farewells to another of his friends. Later, just as Kotarou’s discussing what he might be useful for as a member of Guardian with Esaka, the facility is attacked by Gaia. Despite the danger, Kotarou heads out to support Esaka and try reaching Shizuru in time. Since they’re taking time to alert her about the situation, it seems that guardian were aware of her deafness all along; Kotarou was the only one kept in the dark about it. And that’s not all. It’s implied that Imamiya is even aware of Kotarou’s first death. That was never really explained though. After reaching Shizuru, she storms out into the halls fighting off all the enemies one by one and healing whoever she can with her power. Eventually they encounter Sakuya facing off against Esaka. Esaka and most of Guardian seem convinced that Sakuya is a brutal monster, refusing to acknowledge his humanity. Shizuru is forced to fight Sakuya, while both sides lament the situation. In the middle of the battle though, Chihaya comes out and asks Sakuya to stop fighting. She announces her intention of quitting Gaia to everyone, in order to avoid having to fight Kotarou, Shizuru or Lucia. Before they leave, Sakuya warns Kotarou about his rewriting power, about how a man once used it to live forever. With that warning, the two leave the battlefield; yet another farewell. Not long after that they get in touch with Gen-san and find out that he had been mortally wounded saving a child. With his last moments, he asked how Kotarou’s relationship with Shizuru was going. He spoke of his wish to leave behind good memories for them, before hanging up. Kotarou and Shizuru are forced to say goodbye to someone again. Why all of these farewells in rapid succession? The remaining Guardian forces mobilize in order to secure the Key. Kotarou has found his use as an ‘eye’, someone with the ability to see the Key. 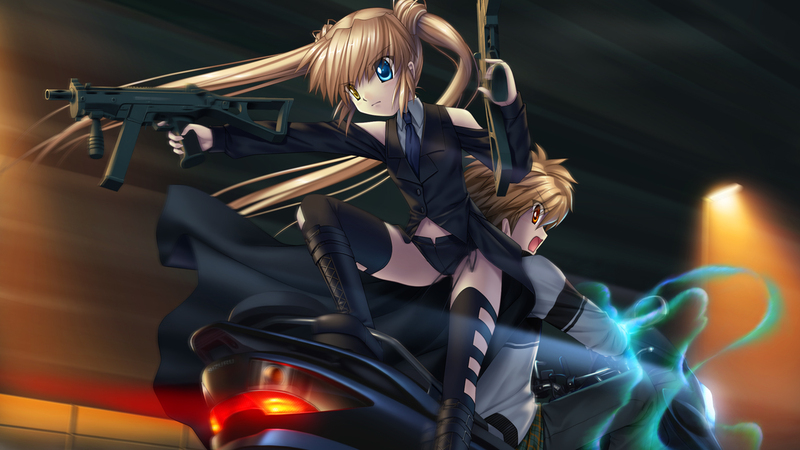 He and Shizuru head out into the forest on a motorbike, fighting off packs of hounds on the highway. There they encounter Nishikujou, where they group up and charge into the forest on foot. In the forest they encounter the Key, already activated, and Akane with it. It’s already too late. Akane explains how she just wants everything to end without any more suffering, and disappears into the forest. The three futilely try to prevent salvation from happening, but there’s nothing they can do. Nishikujou even uses all of her power to try to destroy the Key’s shell, sacrificing herself, and yet it still didn’t change anything. After a final farewell to Akane and Nishikujou, Salvation begins, swallowing up all people in the world in beams of light. The Key disappears, and Kotarou and Shizuru receive a call from Esaka telling them to escape to the ruins on his land if they want to survive Salvation. Everyone in the city continues living their lives completely unaware of the destruction happening around them. After having paid their farewells to everybody, the world has come to an end. Kotarou and Shizuru desperately hurry to try and save Shizuru’s family before they disappear, but in a cruel twist of fate they all disappear just as they arrive. They meet Esaka in the park, and he decides to stay with the city in it’s final moments, embracing his salvation. At the last moments, Kotarou makes a decision. He is aware of the toll his life has had on Shizuru. He uses his rewriting power to restore Shizuru’s hearing and speech, but loses a lot of his own life as a result. And he realizes, if they continue to remain sharing a life, then they’ll both die very soon. In order to stay alive, Kotarou decided to stop running and do something only he could do. He decides to stay and rewrite himself into something which could survive salvation. By doing so he’ll be able to return Shizuru’s life force to her and continue living himself as something new. He promised he would remain here, and that he would wait for Shizuru to find him. It personally took me some time to accept this outcome, but in the end a longer life together is probably the best result. Kotarou knows he isn’t human any more, so perhaps he can change into something different so he can be with Shizuru forever, just like he wanted. They speak their love to each other and say goodbye; one last farewell. 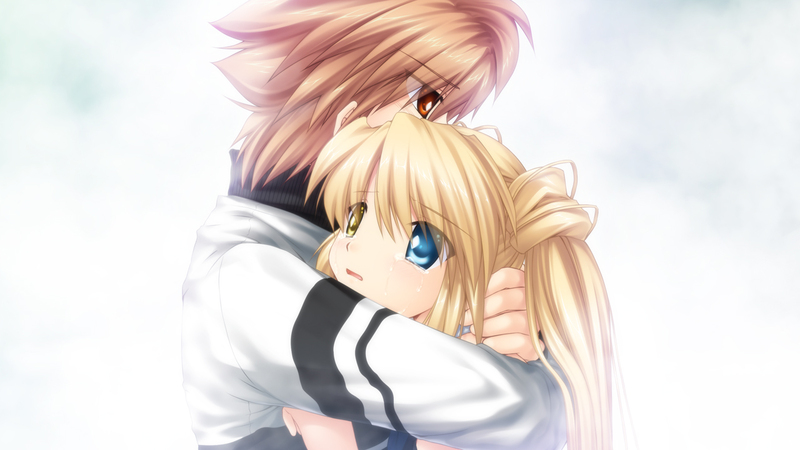 Shizuru escapes to the shelter while Kotarou walks into the distance, sobbing uncontrollably as he does. 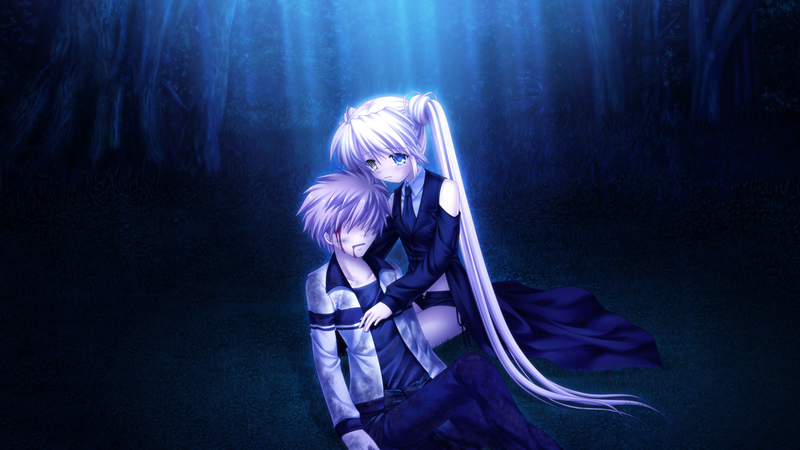 In his last moments, he hears the voices of Gil and Pani, who decide to stay by his side at the very end. In the ruins, an old book was discovered and translated by a psychometer. It reveals the existence of an advanced intelligent species that existed before humanity, but was wiped out by a previous salvation. An interesting clue about the world. Next, we are shown a diary containing Shizuru’s experiences, thoughts and feelings in the shelter. 52 people survived to repopulate the new world. Imamiya is made their leader. Shizuru continues writing about life in the shelter, about friendships and conflicts, about people dying and being born, and about how much she misses Kotarou. She’s able to see the moon outside a window, I think that’s an interesting point. 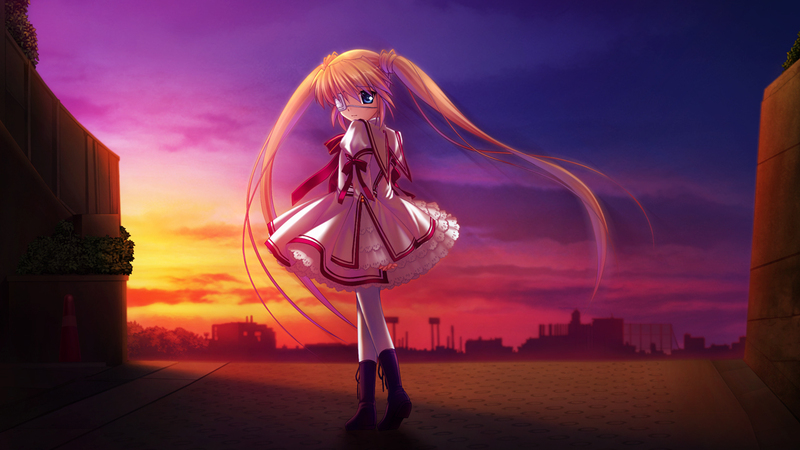 Rewrite is all focused on the Earth, but what about the moon, and other celestial bodies? Do they have a will, or life force? I wonder if I’m looking into it too much. Shizuru discovers Kotarou’s recording, and it brings back a deep longing to see him again. As the entries progress she seems to enter a negative spiral, and eventually stops writing altogether, before picking it up and starting again after an unknown length of time. She writes about her mixed feelings, not knowing whether to give up or believe that she’ll find Kotarou again. In the end she decides to believe in his power, and then we finally get to see her return to the surface. The city has become unrecognisable since salvation, being completely covered in greenery. 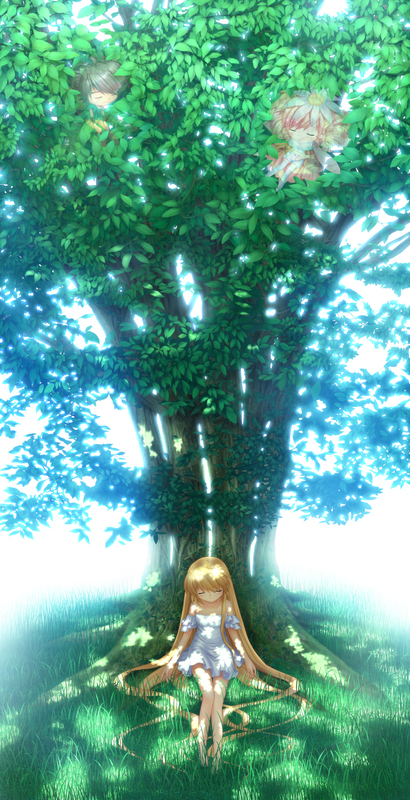 And in the end, Shizuru finds a tree on a hill and, from the connection they still share, realizes it’s Kotarou. Result? Mixed feelings for sure. On the surface this is probably the worst ending possible. Everyone on the world except for a handful of people end up disappearing. Enormous losses. But all of the routes up until now have been very character-focused, and this is no exception. Kotarou had one wish: to live happily together with Shizuru forever. And he seemingly granted that wish with his power. It’s up to the reader’s interpretation to decide if this is a bad or good end. It seems like Kotarou maintained his consciousness despite being turned into a tree, so maybe it’s not so bad. They both found their happiness in the end. I do have to wonder how suitable a tree would be for a boyfriend though. This wasn’t the end; it was a beginning for them. Looking back on Chihaya’s route, maybe we can even assume that Kotarou will regain a humanoid form again, just like Sakuya did when he turned into a tree. But that’s up to the reader to decide. A very open-ended ending. Maybe many people will be unhappy with this kind of ending, but I can see it as a happy ending for Kotarou and Shizuru. This route was the farthest thing from disconnected; it was littered with references to the other character routes. I think this route would make an excellent final route. All of the heroines got a moment in the spotlight, and even some lesser characters too. This was a route about saying goodbye to everyone before the end finally came and took it all away. It’s very sad, but also satisfying in how it treated the characters. Also, it seems like my previous theory about Salvation has been debunked. It doesn’t turn back time, it just consumes everything. I was thinking for a time that Kotarou might actually be Sakuya if my theory was right, but that didn’t end up being true either. They seem to share a very strong connection though, leading very similar lives. It’s probably just a quirk of fate than some deeper connection though. Kotarou was branded as Sakuya’s successor for a reason. Not much else to say really. In many ways it was a pretty damn depressing route, but at the same time there’s happiness at the end of the road, but only if you’re willing to accept it. This route won’t be for everyone, but I think I understood what it was getting at. It’s about coping with loss, and finding happiness wherever you can. Next is Akane’s route. Be prepared; it’s going to get intense. Hey man, glad you’re enjoying Rewrite and actively trying to see everything for what they are. Interested in what you think of Akane’s route, as it’s my favorite character route in the game, with Moon as my favorite part of the game. Looking forward to it! Now, Shizuru’s route… Well, I’m one of the die-hard happy-ending lovers, so I was kinda sad when they ended up being “together”, but he was a tree :c She was my favourite character, and I really wanted a better ending for her… But well, we can’t ‘rewrite’ (best pun ever (?)) the route. I know that feel bro as I also am one of the die-hard happy-ending lovers, but it wouldn’t be a “Key game” without a ending like this, or would it be? This is my favorite route of all the other heroines, so the other fans of this route out there are not alone! XD Now I just need to start playing Harvest Festa so that it can fill in the holes of the route’s plots, to get a better understanding and witness the aftermath of every route out there. I’ve only just found this site when I was looking for some place to discuss my feelings/read an interpretation of the ending written by a person with higher intellect right after finishing Shizuru’s route, because I understood what happened but was still somehow lost, I just couldn’t accept what had just happened. And I have to say, your reflection is amazing. You were very good at interpreting implications and subtle details throughout the story, which cleared up my doubts and made me feel better. Shizuru’s route was also the fourth route I did, so Akane’s route is up next for me as my last before Moon/Terra. I’ll be looking forward to your next reflection after reading her route myself. This route was awesome! 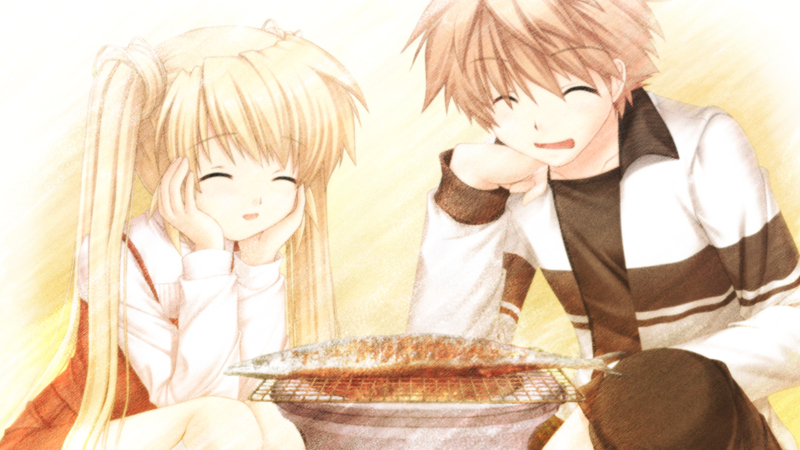 I think it’s my favorite route and Shizuru is my favorite character so I really enjoyed it. Even her theme song, Koibumi, is my favorite and we are talking about a Maeda Jun/Nagi Yanagi soundtrack. This is my first visit to your blog and it is very well done. I just finished Shizuru’s route and the one thing that I couldn’t understand was the identity of the voice that saved Shizuru from her coma. Because of what happened in Kotori’s route I assumed it had something to do with the Key but by the end of Shizuru’s route it made no sense. After your explanation I can definitely see the voice belonging to Kotori. One thing I really like about this route is that all the main cast were in it. One thing I’ve noticed in my time playing VN’s is that once you enter a route most of the other heroines either seem to disappear or just stay in the background. The only exception I can think of is one or two routes of Clannad so I am very, very happy that all heroines and major side characters got a chance to shine in their own ways in this route. It gives a sense of depth than if they just focused on Shizuru and ignored everyone else. I agree that out of all the character routes (excluding Akane’s since I haven’t played through her’s yet) Shizuru’s is the saddest of the endings but I believe it is also the most powerful yet since it deals with so much loss but at the same time shows that even after everything that happened there was still hope for happiness. Her ending was also very bittersweet in the regard that while Kotarou isn’t human he still kept his promise to her and they are still together. Plus with what we learned through Sakuya in Chihaya’s route there might still be that possibility that Kotarou might return as a human/familiar. All in all I see this ending as more sweet than bitter and I love it! Your summary and reflection on her route is very well written and fun to read!^^ I look forward to reading the others and Akane’s (after I’ve finished her route).